Tufts University has been the perennial underdog since their deep run at World Cup IV. Prior to this season, they had never won a tournament. However, this fall, they took two titles in spectacular fashion: the first dealing University of Maryland its first out-of-range loss in three years and the second by taking the regional title over the strategy-focused New York University. That being said, both of these teams have taken a win from Tufts and, in order to keep up the momentum, the Tufflepuffs need to look at what is working and how that might need to change. Right now, the squad is a big fan of two-male beater sets. Their beaters are good and the added physicality is usually enough to give them the edge, but challenging Southwest teams on physicality and giving a mismatch at chaser, even with their talented female players, is not a recipe to make it to the end. Their biggest challenge, though, is to develop a go-to seeker. In both of their championship games, the quaffle players took it out of range while their seeker struggled, only catching when the snitch was tired or handicaps made their job impossible. Aside from the obvious risk of giving the other team time, it relies on the Tufts’ players to have more stamina than their opponents and, every game this happens, the players will be that much more exhausted as they go further into the tournament. Tufts will face games where they pull into range one possession at a time, especially in a format where you play increasingly harder or more even games, and their seeker needs to be able to make the grab in that instant. In the Northeast finals, they exhibited the revolving door approach to seeking, sending fresh ones in to get a go at the ever-tiring snitch. If they want to continue that approach, these people cannot just be players who are only chasers or beaters and will go in to seek. They need to be a true hybrid: players who dedicate some serious time practicing against snitches, not just trying it when their chance at a title is on the line. Tufts is a balanced team with talented female players—particularly in captain Hannah DeBaets—that grants them the confidence to play with an all-male beater set. The female players will typically drop behind the hoops looking for an open opportunity, while players like Noah Schwartz or Ethan Sturm will try to drive. Their keeper, David Stack, is a fan of long shots, as evidenced by the shoot-off he had with NYU keeper Zack Gindes in their Northeast Regional Championship finals match, but he is not afraid to drive when he sees the opportunity. The result is an offense dangerous at all ranges. Once they have bludger possession, they do not like to let it go, but will press up when they see an opportunity. However, it cannot be stated enough how important it is to get control from them. With Tufts having threats at all ranges, the opponent’s quaffle defense has to stretch itself, but this is a vicious cycle as a stretched defense just creates bigger holes. Once an opponent has the wiggle room two bludgers allows, they can deal with the majority of Tufts’ threats by staying close to the hoops, clearing out the players loitering behind the hoops and cutting off any player driving in while the keeper picks off long shots or long passes to the opposition behind him. In failing to attain bludger control, there is still the opportunity to exploit mismatches. Tufts’ female players are very talented but are giving 20-30 pounds to many players. Most teams get flustered as Tufts hits them from the left and right, forgetting who they should be stopping because someone else is going to score, but a cool head is key and every tool taken from Tufts just makes them more predictable and, consequently, more beatable. Miami University, at least in the quaffle line, is all about speed. Their chasers are constantly moving, which allows keeper Matt Mignery to always have access to an open passing lane. The beauty of the Miami attack, though, is the keeper doesn’t typically remain at midfield after distribution. Once the pass is released, the keeper will roll into a position where he can further help the offense. The team doesn’t have a lot of muscle, so driving isn’t much of an option. This has led to their passing attack being one of the better ones in the Midwest. They have a lot of chemistry and that can be seen in the offense. Defenses have to always be alert, otherwise they’ll lose track of one of those Miami chasers and it will result in 10 points. That being said, chaser play is not Miami’s biggest strength. It’s their female beaters: Tina Kinstedt and Stephanie Raudenbush. They create a very strong unit, and their performance often dictates the performance of the team as a whole. They are smart and have great field awareness. They elevate the play of the male beaters beside them to make the beaters the backbone of this team. So what does all this mean? Simple, the key to beating Miami is to neutralize their female beaters. Even in a game where their offense is struggling, their defense is more than strong enough to shut down opposing offenses and keep them in a game, even without bludger control. And while their seeker game has improved by leaps and bounds, it still needs a strong bludger assist, making the strength of their beaters even more important. As long as they are able to play their game, Miami is capable of pulling some wins. However, I don’t see them beating any teams within the Top 20. Miami, as a program, has consistently been defined as it what could be or, more accurately, almost is. The 2012-13 season saw Miami almost qualify for Division I of World Cup VI and reach the semifinals of Division II. 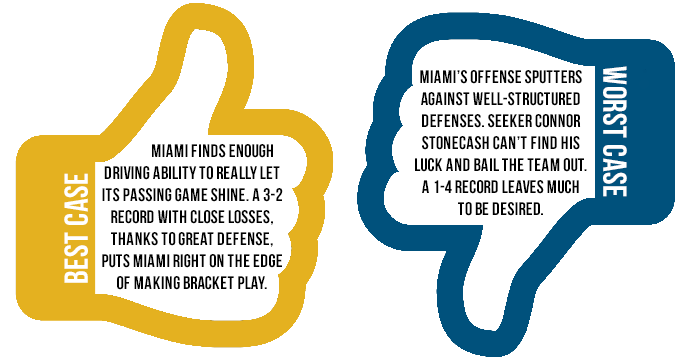 The following season saw improvement but, yet again: Miami was two snitch grabs—while leading—away from turning a 1-3 pool play record into 3-1 and a bracket play spot. For World Cup 8, how does Miami transition from near-contender to legitimate contender for bracket play? Let’s start with the defense. This unit is anchored by a Top-20-caliber beating crew of the aforementioned female beaters Kinstedt and Raudenbush and their partners, Michael March and Braden Grimes. Surrounded by a bevy of intelligent and aware quaffle players, this defense doesn’t make it easy for opposing offenses. Seeing as Miami has only given up more than 10 goals three times this season, I’m confident in saying the defense will hold strong against all but the most elite of offensive attacks. The problem arises when Miami has the quaffle: they simply struggle to score against top-tier teams. Miami has played nine matches against teams receiving votes in the most recent Eighth Man rankings and only averaged 3.5 goals per game in those matches, never scoring more than five. A potential maximum of 80 points simply won’t get the job done against a Top-20 team. At a World Cup with the Swiss bracket system, it’s almost a certainty Miami will have to defeat at least one. Miami’s passing attack is advanced but not top-tier, and I’m not sold on there being a player or group of players who can take the game over themselves when passes aren’t reaching their targets. The two best options for this, in my mind at least, are chaser Brian Neibecker or keeper Mignery. No matter who it ends up being, at least one player is going to have to step up, demand the ball and put the game in their own hands for at least a few possessions per match in order to help keep a great defense on its heels. Last year, in its inaugural season, TC Frost claimed one of the final Midwest bids for World Cup. This past November, it claimed the very last bid. While not being impressive at any one facet of the game, the best thing that this team currently has going for it is its core group of returning players. 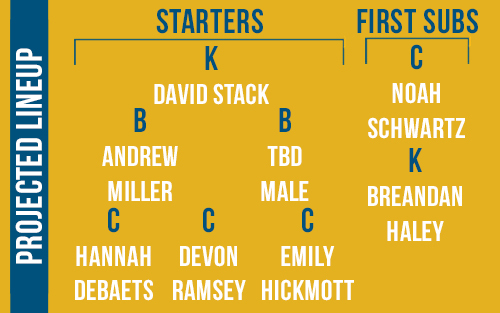 The fact that this year’s TC Frost fourteen players (seven males, seven females) qualified for World Cup with an even more depleted roster than last year’s squad, further highlights the performances of those who have helped shape the team. Luke Zak has been a driving force as TC Frost defies expectations; his reliable presence at keeper, long-limbed seeking and extensive quidditch experience have been put to good use. Zach Miller, a veteran of the University of Minnesota’s intramural league, came to the team as an undersized chaser with great agility and an improving ability to play above his stature. 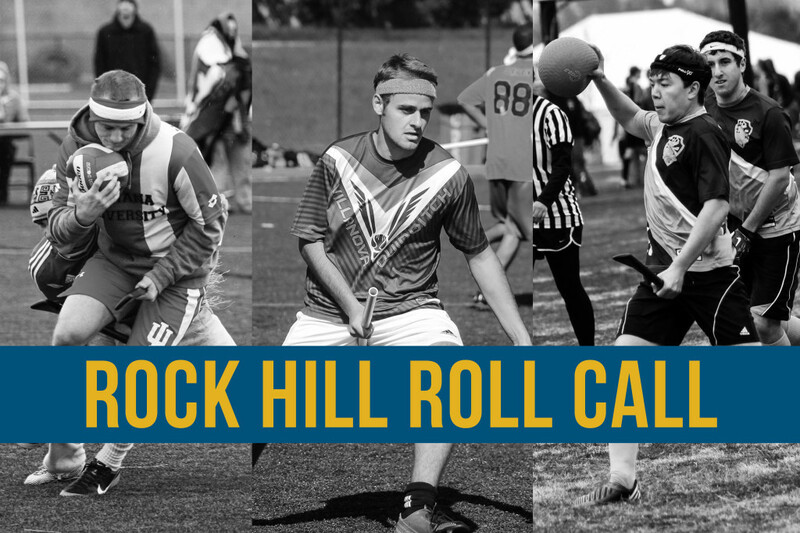 Zane Kaiser and Tia Tourville were new to quidditch when they joined, but they now currently anchor their team’s beating corps and are often found maintaining bludger control in TC Frost’s zone defense. TC Frost was formed in Minneapolis and therefore has suffered not only Minnesota winters but also the chill that comes from living in the shadow of University of Minnesota. 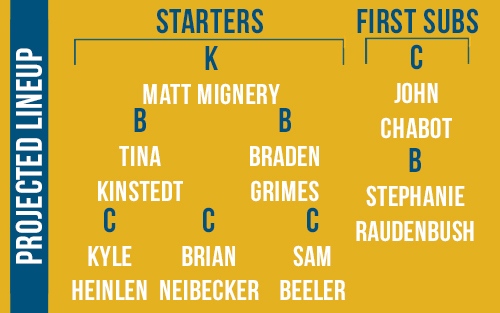 However, TC Frost is able to find consistency from the handful of players who have been with the team from the beginning. These players continuously turn in performances that allow the team to succeed, and they are gradually making the rest of the team better. But will better be enough? Recruiting difficulties have prevented TC Frost from maintaining a steady gender ratio this season. With a less-than-ideal surplus of female substitutes, the team’s male players will need to log more crucial minutes in April. This burden falls on the team’s three best athletes: Matt Bessard, Tim Clemens and Alex Obanor. As a keeper, Bessard’s development is crucial to a team whose only other feasible option at the position is the part-time seeker Zak. His long frame has made hoop-blocking a natural aspect of his game, but leading an offense is a responsibility Bessard will need to become better acquainted with in Rock Hill. Clemens is the most physically imposing (and the hairiest) player TC Frost has to offer. His rugby background made the transition to playing physically an easy one, but if he can score as often as he breaks tackles, both his and his team’s stocks will rise quickly. Obanor’s athleticism and jukes have the potential to cut through many opposing defenses, but what he lacks is the informed decision-making that comes with experience. With time, Obanor could be the offensive ringer TC Frost needs in order to make deeper tournament runs. As it stands, TC Frost harbors a slim chance of winning multiple games in Rock Hill. What Bessard, Clemens and Obanor will do is create a higher ceiling for TC Frost to operate under. 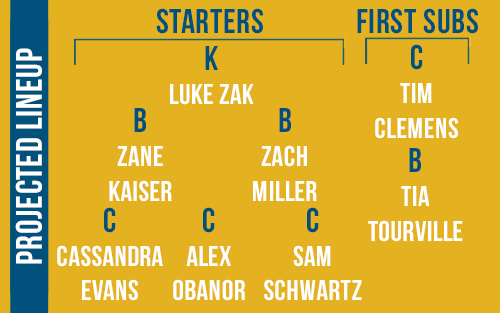 With enough time to develop chemistry, this team could become a legitimate threat in the new Midwest region. For now though, TC Frost’s main concern is that they don’t melt come springtime. Graphics and photo illustration by Amanda Dallas. Original photos by Nicole Harrig and Matt Dwyer.